A recent study conducted by the Bank of Montreal revealed some interesting statistics about Canadian retirement plans. We refer to this retirement study throughout this post. We also suspect that Americans reading this post will have similar statistic. Or possibly even worse since Canadians are known for higher savings rates than Americans. Also for our American readers an RRSP is similar to your 401k. 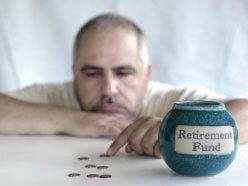 We certainly do not want to be like this guy in the picture with no savings at all for retirement. Meeting Retirement Goals is a key objective for many consumers. Eighty per cent of Canadians are not confident that their RRSP investments will provide enough to meet their retirement goals. In fact, most people do not have retirement goals. They have no idea regarding how much money they will need at retirement. Or how much income they will have during retirement. This is a really scary situation for many people. Since it is a well known fact that government programs will not even come close to providing a reasonable income. This will place most people below the poverty line if they do not have other income from other sources. Canadians have uncertainties about meeting their retirement goals and are not sure they are taking the right steps in planning for retirement, according to a survey released today by BMO Financial Group. The survey focused on RRSP’s and did not assess other investments that Canadians may have. In Canada, RRSP’s are the tax free savings vehicle of choice for most people. Income within the RRSP is not taxed until it is withdrawn from the RRSP and the contributions to an RRSP can decrease the total amount of tax paid in a given year. Some Canadians, probably a relatively small number, will have savings outside the RRSP, however all income from these investments will be taxed in the year the income is generated. There is no magic, one-size-fits-all number. The amount you will need, will largely depend on your personal circumstances and the kind of retirement lifestyle you want. The key is first to determine what you want your retirement years to look like and then start budgeting for them. Start by developing a budget based on your current life style based on your current income and your current expenses. Take into account all expenses, including those that are discretionary and non-discretionary. Once you have this baseline, develop a post retirement budget based on your expected income from all sources, and your expenses during retirement. Both income and expenses will change when you retire. Income will change since you are no longer collecting a pay check. You may be collecting a pension if your company provides a pension and you may collect CPP and Old Age Security payments as well. Your expenses will change a lot. There will no longer be work related expenses; however you will have much more time on your hands. Many people volunteer their time; however they also travel and find additional things to do which usually cost money. Be realistic in your budget planning for post retirement activities. The fact that so many Canadians have no money in RRSPs is troubling. Fewer employers are providing pension programs and people cannot count on the Canada Pension Plan to meet all their financial needs in retirement. It’s essential that Canadians start contributing to a plan on a regular basis at the earliest possible age. At the very least you will be decreasing your tax obligation in the year you make your contribution to an RRSP. If you are concerned about losing your money in the markets, go to a conservative approach for investing within your RRSP. Many Canadians and Americans lost a great deal of money during the last crisis in the markets during 2009. If you invested conservatively, chances are you have regained all of that loss and then some. Risky investments have not fared so well. Stick with quality mutual funds even if the return is not so high. The survey sought responses from a national random sample of 1,516 Canadian adults, 18 years of age or older, and was conducted between January 4 and January 7, 2010. This survey is estimated to have a margin of error of +/- 2.5 percentage points, 19 times out of 20. We have posted other articles on this blog about diversification of investments as well as with investment advisers. Bottom line, do not put all of your savings in one investment. Start by investing a small amount from each paycheck. Before you know it you will have a nice amount saved up and once you get used to not having the funds to spend, saving will be easier. Start now by seeking out a financial adviser to assess your situation and the tax savings you may be able to obtain. Doing nothing is really not an option if you want to have a retirement that is comfortable and meets your needs and plans. This entry was posted in Retirement and tagged Investment Diversification, Retirement Plan on 2010/04/21 by ernie.